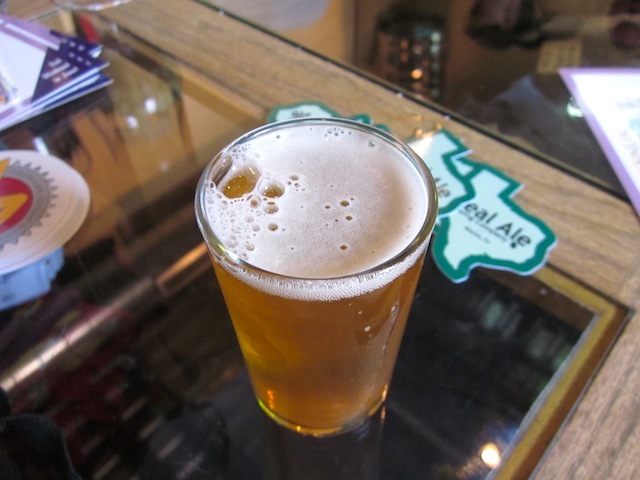 (map) Every Friday is Tour Day at this 18-year-old craft brewery in Blanco. While you wait for your tour, there’s plenty of beer sampling to be had from an ever-changing menu. Above, this Devil’s Backbone Tripel really hit the spot. You can sample beers before, during and after your tour and it’s all free. 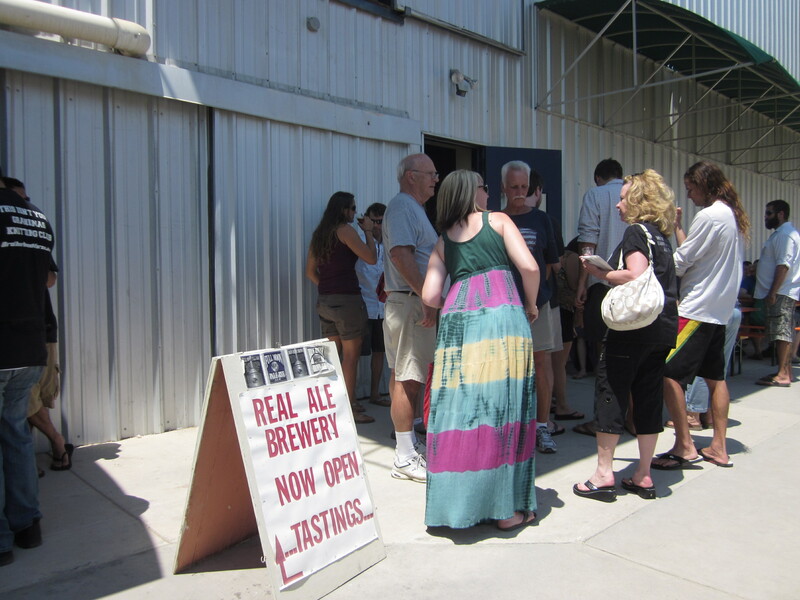 The tasting room is fairly small, so folks mostly mill around outside with their brews while they wait for their tour. Below, Tim the Brewmaster starts things off out front, where big silos store the barley for brewing. He says they go through 50,000 pounds of barley a week. 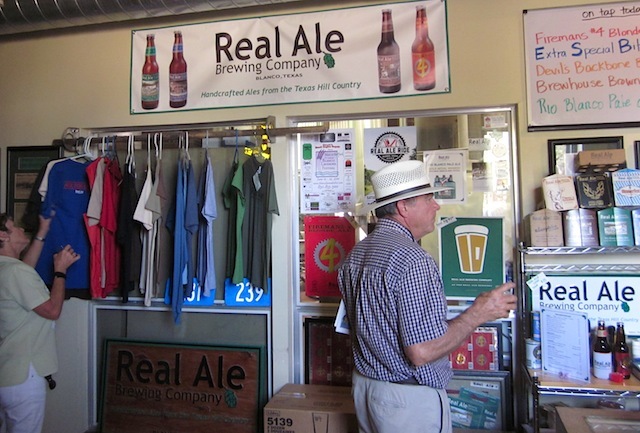 From a tiny brewery in the basement of an antique store on the town square, Real Ale has grown to be the 49th largest craft brewer in America. 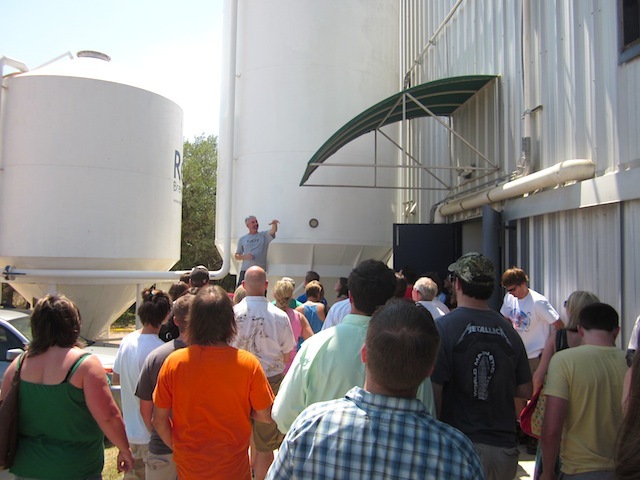 This is a working tour, so you’re down on the floor next to the tanks mixing it up with the workers. 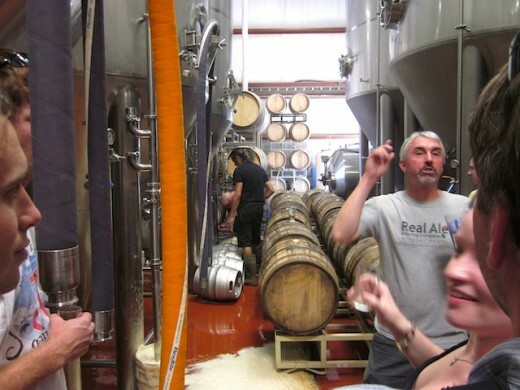 The yeast for the IPA was busy digesting sugars; that foam is what’s spilling over onto the floor. While Black Sabbath played, Tim told us that some of the stronger beers, like Imperial Stout, are aged in bourbon barrels for flavor. 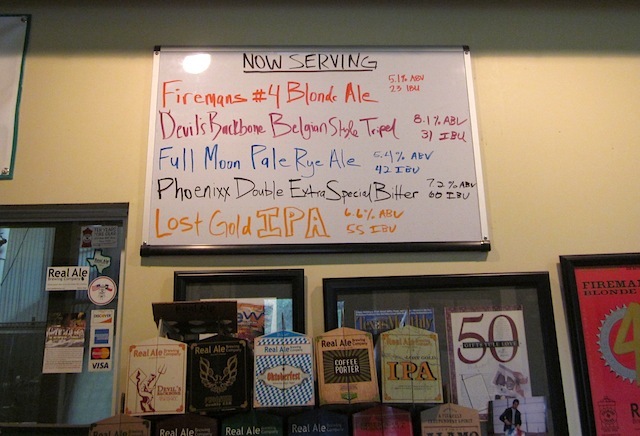 They can brew beer 24 hours a day, and have to, to keep up with demand for the hugely popular Fireman’s 4. 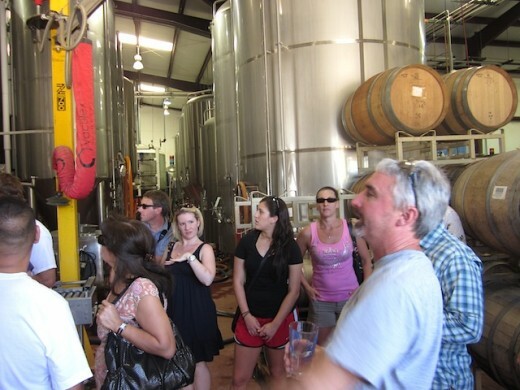 The kegging area, where kegs and barrels are filled from huge tanks. 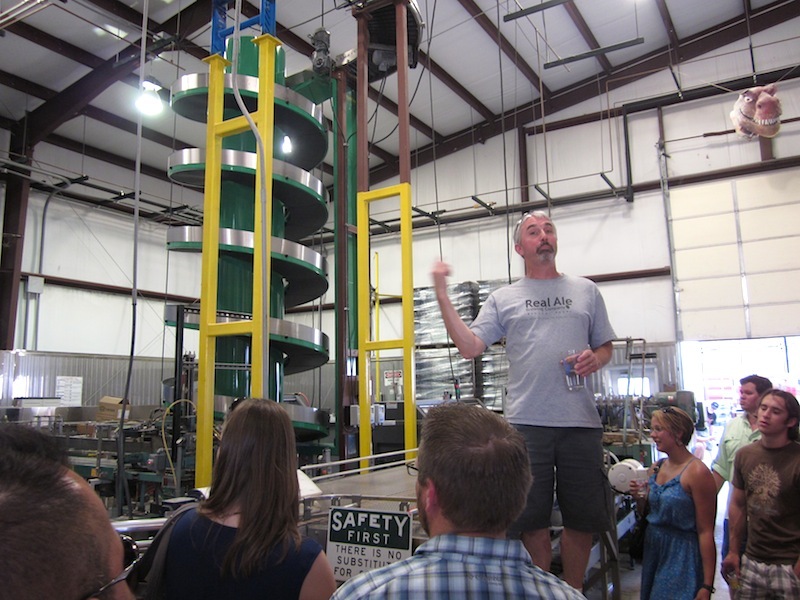 Below, the bottling area, an elaborate Rube Goldberg-like system that winds the bottles on a journey into six-packs, then cases, then pallets. 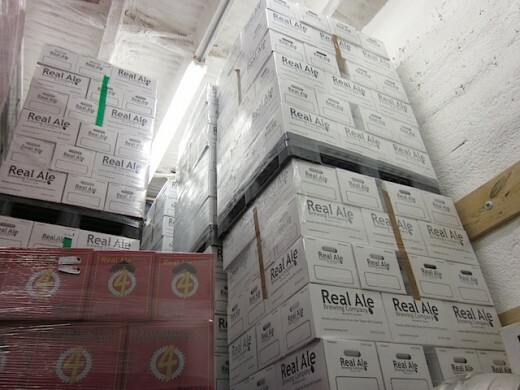 All Real Ale brews are unpasteurized and unfiltered, so they’re kept in a cooler till they’re shipped out. 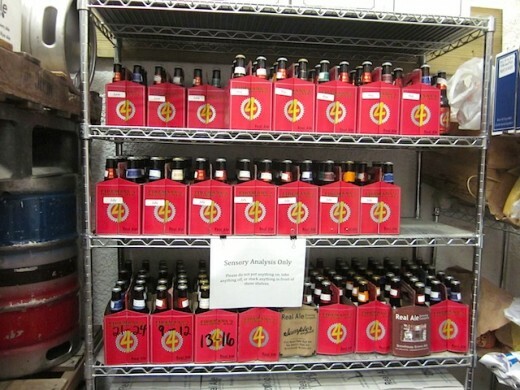 Below are some test beers that are tasted periodically to see how they’re aging. Tough job! The tasting room ladies are happy to hand out as many samples as you want, of whatever you want. It’s a great way to try new beers. The tasting room is open from 2 to 5 pm, with tours at 3 and 4. 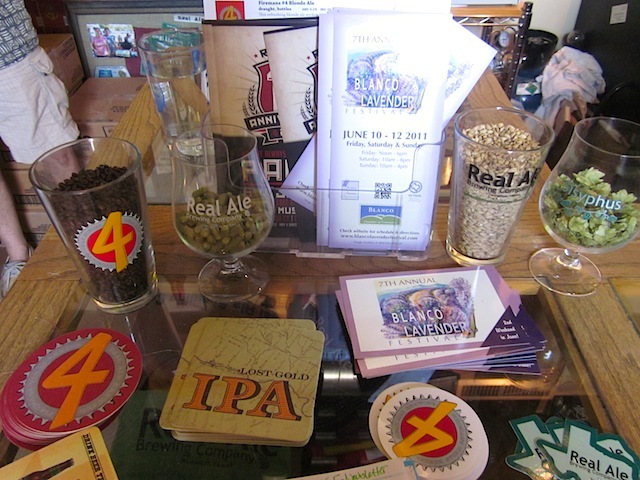 Some of the beer ingredients on display in the tasting room. Yes, those are coffee beans! They’ve also used chocolate. You can buy souvenir t-shirts, koozies, beer glasses and more in the tasting room. 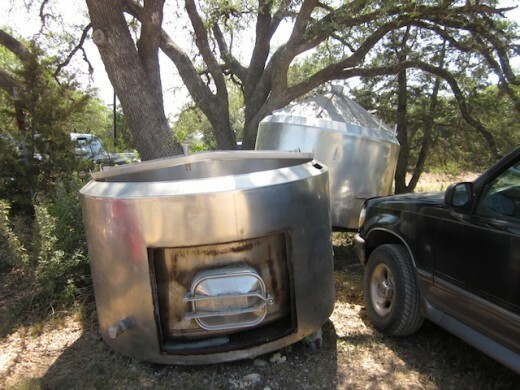 Below, the tiny, original brewing tanks from the basement on display in the parking lot. 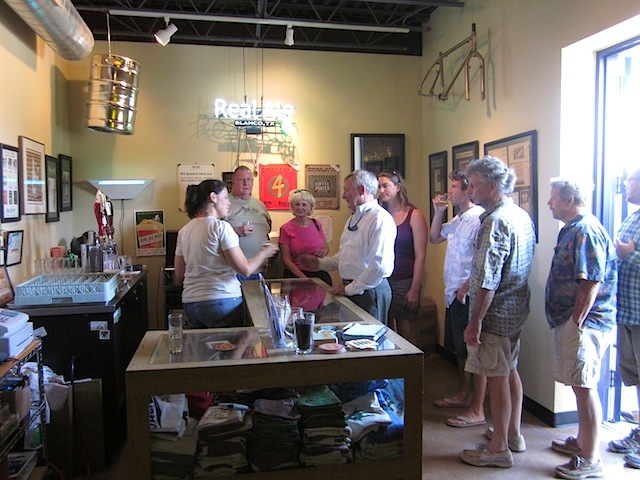 1 Response to Tours at Real Ale Brewing Co.
Love the Phoenixx! It is truly a great beer. The only downside is availability is limited to spring releases….